Fate brought Amanda and Lucy together in May 2017. When Amanda saw that Lucy, her brother, and herself all shared the same birthday, she knew it was a sign. Amanda’s twin brother, Allen, sadly passed away in 2012. Since his passing, Amanda found no reason to celebrate her birthday because it only reminded her of what she had lost. When she saw Lucy’s birthday, she knew Lucy was the one. Although Amanda was hesitant because she had been denied for adopting by other rescues for living in an apartment in the past, she decided to start the adoption process. 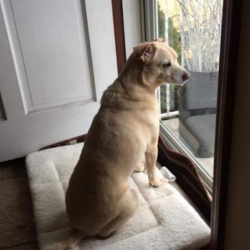 Lucy was found on a Facebook page and listed as “don’t want.” Unfortunately, this sweet girl had been bounced around a few times and really needed a furever home. Lucy’s foster mom, Phoebe, had a list of criteria for the person who adopted her. Lucy needed an active owner who would walk her often, take her to go discover new things, and someone who could commit a lot of time to her. Amanda was a perfect fit. When Lucy and Amanda first met, Lucy was too preoccupied terrorizing the farm dogs and hanging out with her foster mom to pay much attention to Amanda. After an intense game of tug-o-war, Amanda finally won Lucy over and took Lucy home. Even after Amanda let her free roam in the car on the drive home, Lucy was still a bit uncertain of Amanda. That all changed after their first hike together the next day. After their hike, Amanda’s family traveled from Virginia down to North Carolina to meet the pup that she could not stop talking about! Amanda quickly learned that Lucy absolutely loves kids and acts like a completely different dog around them. Her favorite memory of Lucy is watching her and her nephew (age 4 at the time) take a walk with complete ease, despite Lucy still having her bad days on the leash when Amanda walks her. After Amanda’s family left, Amanda and Lucy finally had some one-one time again. It was then that Lucy really learned that Amanda is her “person” and now wants to always be by her side, protecting her. They like to stay busy and have gone on many adventures together, visiting about five states. Exploring a nature trail while traveling is a must for them!